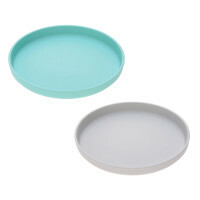 LÄSSIG’s sustainable 2pc Children’s Plate Set comes in many different trendy color combination such as turquoise and grey. The plates can be stacked and are dishwasher safe. Perfectly suitable for children 6 months and up. 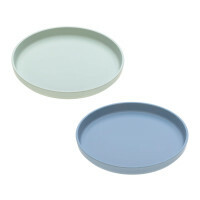 Product information "Plate Set with Bamboo (2 pc), Turquoise - Grey"
Stylish and practical – LÄSSIG’s sustainable two-piece Children’s Plate Set comes in many different trendy color combination such as peach and plum, mint and blueberry, grey and light pink, grey and turquoise. 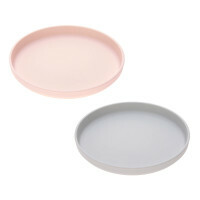 You can mix and match as you like and easily stack them – they are dishwasher safe. Due to their light weight the plates are not only ideal at home, but also on the road, at a picnic, family outing or camping providing the perfect alternative to disposable tableware. There are also matching bowls, cups and spoons from our sustainable series with bamboo.